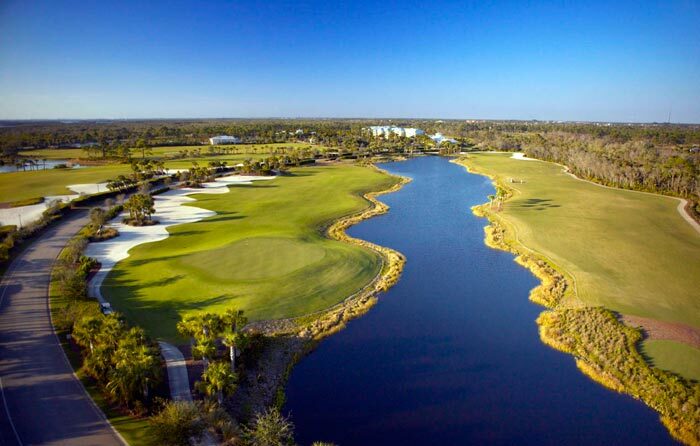 The slick, “bunkerless” fairways of Raptor Bay near Naples play through a surprisingly undeveloped sector of this high-density market. Raptor Bay near Naples begins with an interesting idea: there will be no bunkers. That’s the most notable thing about the course — and also its biggest flaw — and even that premise isn’t completely fulfilled. In lieu of formal bunkers there are large sandy washes running alongside fairways and greens, so there’s still sand, even if you’re allowed to drive and ground your club in it. The setting is rare for this market with the holes cut out of deep woods on the border of Estero Bay and no surrounding development to speak of. 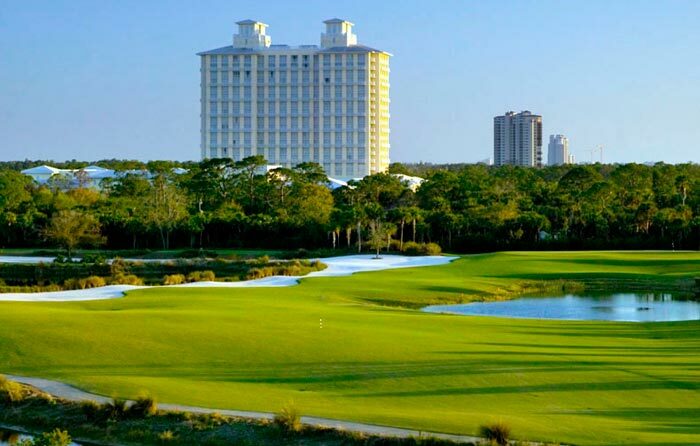 In southwest Florida you have to go to extreme upscale private clubs (Calusa Pines) to buy this kind of isolation, even though a few condo towers are visible around the perimeter. A few high-rise condos can be seen from the property, but otherwise there’s almost no intrusion of homes or real estate. The slick, wall-to-wall fairways and low to the ground green settings are a nice touch, though even this is done better and with more energy at Greg Norman’s Tiburón 30 minutes south. There are some solid golf holes, including the five par-3’s that manage to remain interesting in spite of the lack of topography, and the architects present a good mix of green shapes and orientations so pin positions play a meaningful role in how the holes should be approached.